Some months ago I wrote something about Long Tall Ernie, when he and I were still in our rock’n’roll days. But later in his career he made also a concept disco LP, which in my opinion is highly underrated. I don’t think that many people outside of Holland have ever heard of it, and even most Dutch people will not know Meet the monsters either, as the LP is called. After this LP Arnie Treffers didn’t make any more records of his own, as far as I know, but worked as a producer for other artists, until he died at the age of 48 of long cancer in 1995. I never liked the whole concept of dying. I mean I don’t mind to die myself one day, but why is Life organised in such a way that we have to witness a the deaths of others? Why isn’t it created the other way around? So that we only have to witness one’s own death, and are being spared the painful experience of the deaths of other people. 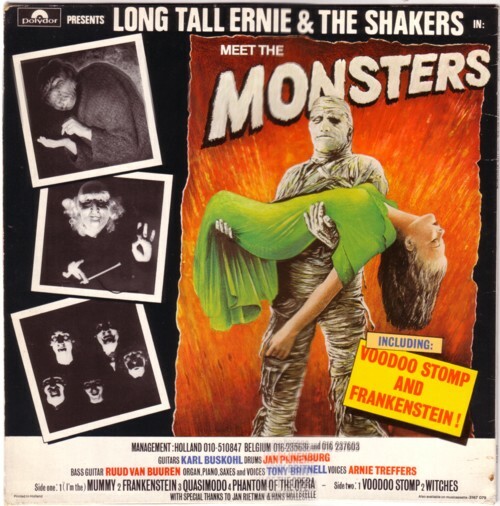 Anyway, here is Long Tall Ernie & The Shakers with The Mummy .